Managing the care responsibilities of an aging loved one can be an overwhelming and often time-consuming endeavor. Over the holidays, my husband and I visited family and witnessed first hand all the people involved in the to care for my husband’s aging grandmother. We were only in town a week, but in that short time, we witnessed doctor appointments, pharmacy pickups, multiple family members dropping by to help with a meal, and a vast number of texts and calls between family members ensuring nothing was missed in the hustle. It takes a team of doctors, nurses, pharmacists, family members, and caregivers to ensure peace of mind and the well-being of the aging senior. As a home care provider, I see the constant need for a well-managed schedule and clear communication between health care providers. At Preferred Care at Home we created a Personal Health Record to help manage the care needs of the aging senior. This in-depth, 15-piece tool kit stores the information you need whether you’re transitioning from the hospital to home or managing multiple health issues and includes medication instructions, appointment dates, and test results. In 2003, 50-70 percent of hospitalized senior patients saw an average of 10 or more doctors during a single hospital stay according to the National Transitions of Care Coalition. And those with chronic conditions see up to 16 doctors. With statistics like that, managing the care of our aging loved one is more than a full-time job. At Preferred Care at Home, we know what is needed to provide the optimal care for your senior loved one and we can help organize the moving parts for you. The right care management in place can eliminate the stress and worry many family members feel every day. If you are a family caregiver, overwhelmed by the endless moving parts of managing your loved one’s care, contact a Preferred Care at Home location to learn more about our services. 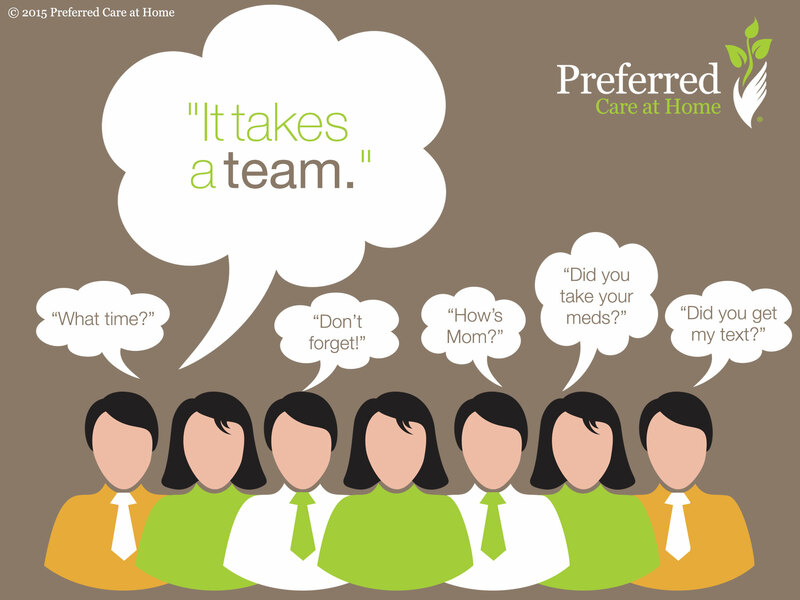 From one to 24 hours of care, professional caregivers can be by your side providing the care you need, when you need it.